Although I don’t much like working after dark, it can often add a little drama to images, and digital cameras work so much better than film in low light. As I’ve often mentioned, the really important thing for me about this is that it enables me to produce much better images with flash. The protest against vulture funds – companies that have bought up bad debts run up in the past by failed regimes for a small fraction of the original load (in this case the Argentine junta) and pursue their successors in courts around the world for every last penny started as light was fading fast, and I took my first pictures as the protest was starting by available light. The light was rapidly fading, and soon most of the ambient was coming from street-lights and the windows of shops and offices, and was extremely varied in both quantity and quality. 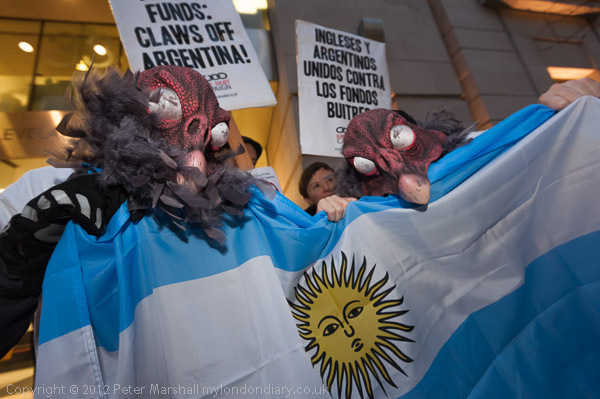 Most of the pictures I took were using flash, and in the images in Vulture Funds – Claws off Argentina! there are some examples of both ‘good’ and ‘bad’ flash techniques. ‘Bad’ flash is sometimes all you have time to do, when you haven’t got time to do anything but grab the moment, and the obvious defects can sometimes produce interesting results. So while I dislike the obvious shadow of the placard, the over-lit face of the young girl holding it does make her stand out in a dramatic fashion. Taken with the lens at 18mm (27mm equivalent) she was pretty close to the camera, and was moving around pretty rapidly. My main aim in framing was to include the message of the placard – slightly truncated but it still gets over the message that the vultures should take out their claws – and also I’d been trying hard in other frames to get in the ‘drop the debt!’ message on a number of t-shirts worn by the protesters. But the walker at top right with shoe and saucepan (and the other saucepan) is an example of the little bit of luck we need and just occasionally get. 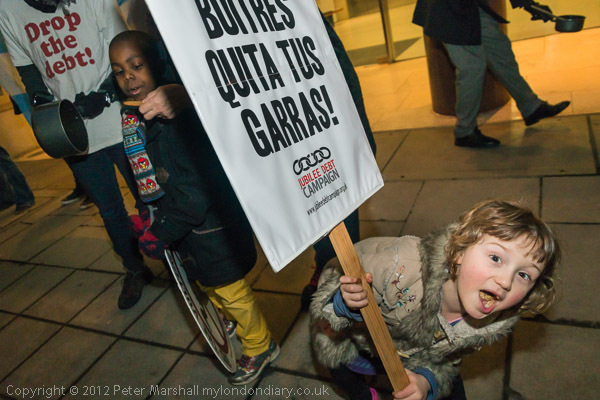 This was taken in a particularly dark bit of pavement at one edge of the protest, and was one of a series of around 50 pictures I’d made trying to get a strong image from these two kids, who were very playful but extremely uncooperative. I could have posed them – and another photographer did, but that would have lost the incredible energy that I saw. And I don’t do that sort of thing! People posing for me of their own accord I’m happy with. Of course the picture from the camera didn’t quite look like this. Her face was very close and like the placard needed considerable burning down to give an effect like that I saw, while the young boy’s face was rather darker, and needed some dodging. Using flash often needs quite a lot of post-processing. One thing I missed when doing it on this image was the biscuit in the girl’s mouth, which could have done with rather more toning down. 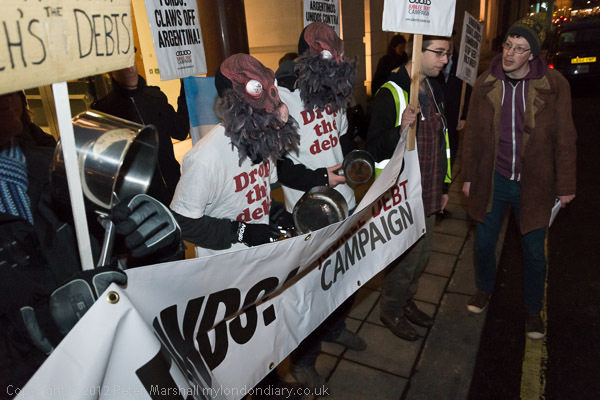 Another example of flash is this image of the vultures with pans holding the banner. I’d decided to work (as usual) from the side and needed a fairly high viewpoint to see the pans they were banging behind the banner. Flash was essential, but the nearest part of the image was perhaps a couple of feet away from my lens and the furthest perhaps ten or fifteen. Using the inverse square law, the difference in light from the flash would have been in the order of something like 25:1, perhaps 4 or 5 stops. You can cut down the ratio simply by aiming the flash away to the right, swivelling the head on the SB800 around 45 degrees. I was using the built in diffuser and rather ineffective reflecting white plastic, which gives slightly more even lighting and there was still more than enough light at the left edge of the image. Using a high ISO 3200 also helped, giving a little fill from the street lighting, although most of the light around was actually from the windows behind. Because there was a lot of vigourous pan-bashing happening, I was working at a fairly fast shutter speed – 1/320 – and the results for this particular image would have been better had I thought to move to a slower speed. I’d simply forgotten to do so. Again, a straight jpeg would have showed much more uneven lighting, and I’ve dodged and burnt to get the result I wanted, rather more like how the scene actually appeared than a completely straight result. I haven’t got it completely right, and the light is still rather uneven. The furthest parts of the image are also noticeably ‘noisier’ as a result of needing to be brightened in post, but the result is still usable. One of the things I also found it that photographing vultures isn’t too easy. It was very easy to find angles from which vultures don’t really look too much like vultures. 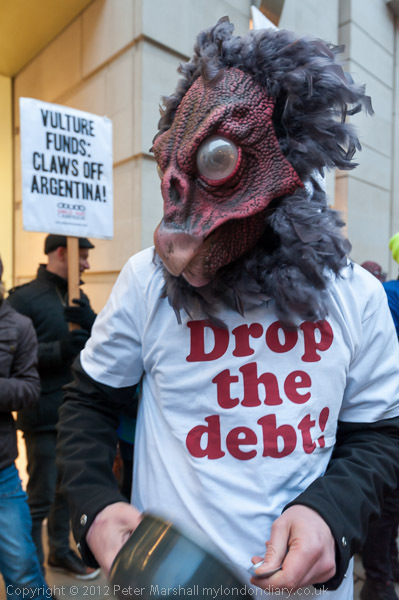 I’m rather more used to photographing people – and there are plenty of examples of that to, as well as more in the issue in Vulture Funds – Claws off Argentina! This entry was posted on Wednesday, March 6th, 2013 at 10:30 am and is filed under My Own Work, Photo Issues, Technical. You can follow any responses to this entry through the RSS 2.0 feed. You can leave a response, or trackback from your own site.